There is no shortage of good and free image managers or organizers, but Picasa ranks a strong number on our list. It offers almost every feature expected from a similar application, from importing to sharing images, image editing, elegant image gallery, and then some. This image hosting site stands apart from the competition, thanks to its flexibility, usefulness and dedicated support. Your systems performance is not going to be hampered at all as the application runs very smoothly and lets its users edit and organize their images as per their penchant. It’s still lacks Facial Recognition feature, other than this scarce; it outrivals other image organizers through its ease of use. 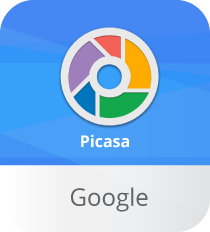 Not to forget, the Google advantage it has, therefore Picasa is used by millions worldwide and is, beyond doubt, a great image management utility for Windows. Picasa is one of the industry leading image managers and image editing tools. The image manager is a one-stop solution for editing and organizing all photos available on your device. It features a powerful system scanner that automatically finds and catalogues all images available on your device. Image sorting is based on folders and creation dates. Picasa features an elaborative UI that provides all details about images such as date, size on disk, image format, picture resolution, etc. You can easily edit, modify and share your photos right from the opening screen of the program. Direct options for attaching images to emails and publishing on social media sites are also available right at the main screen. Picasa brings some of the most powerful and easy-to-use image editing tools at your service. The image editor offers one-click effects that save you from the manual labour of adjusting visual details of an image. It also offers several filters that you can use for instant edits. The image editing tool offers a number of other features like making gift CDs using your images, making labels for pictures and creating new groups to catalogue the images based on specific attributes. > Drag & Drop Support – Picasa allows you to simply drag & drop images and albums in and out from the image editing and management tool. > Integrated Picasa Web and Google+ Support – Picasa lets you share, store, manage and edit all your photos on Picasa Web. It also allows you to share images with your friends via Google+. > Sorting With Tags – Picasa offers a unique tag feature that lets you add tags to images for easier storage and management. > Advanced Editing Tools – The image editing software features a broad set of editing tools that lets you crate posters, screensavers and even montages. > Adding Attributes – You can add a number of attributes to all your photos with Picasa. The image manager and editor allow you to add a number of attributes such as geo-tags to the photo to make them more informative. Picasa is one best image editing and management tools that lets you organize and deal with all photos available on your system. It even catalogue image from locations that you’ve forgotten. Download Picasa now and start making your images more magical than ever. I like the one-click effects to adjust visual details of any image.